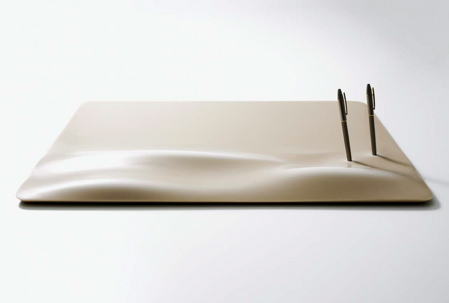 Solid surface, the next great surface? Hasn’t this product been around for a while? Well, yes it has, 42 years to be exact. Having said that, it is still one of the younger surfaces we have. Solid surface is one of the few surfaces that transcends all aspects of design. You see it in the traditional countertops, but a new wave of designs and patterns are starting to sweep the industry. Many designers see the surface for all of its value. They take advantage of it’s translucently to create ambient lighting designs. It can be anything from a surface to reflect light off of to set a mood, to making a traditional lampshade or lamp enclosure. The light illuminating from behind can be subtle yet inspiring, something that can not be duplicated by other surfaces. Others look at the thermoforming capabilities. Yes, the material can be bent and shaped into a variety of objects from furniture, dishware, cabinets, wall cladding, etc. Really the only limitation to what is achievable is the imagination of the designer. 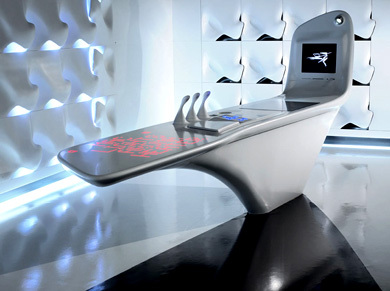 A classic example of imagination and thoughtful design using Solid Surface is the Z-Island Kitchen by Zaha Hadid. It consists of two islands, wall cabinets and thermoformed wall cladding that emphasize sound and light technology. Take a look at the picture you see here. I also encourage you to do an Internet search regarding this island to fully appreciate what has been designed. Now its likely Mrs. Smith on Main Street isn’t going to put this concept into her kitchen this year. But, there are many elements here that we can incorporate into kitchen design now. How about an LED message board on your full back splash? 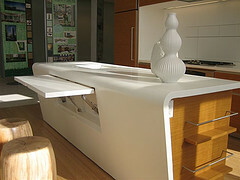 Or how about an island counter top that has a thermoformed dropped apron that reaches to the floor. Industrial Designers have really taken hold of Solid Surface. They are always looking to leverage material capabilities. A classic example of this was at the ICFF show (International Contemporary Furniture Fair) held in May 2007 in New York City. Dupont Corian’s booth that was inundated with Designers. Their imaginations were fired with what solid surface could become. Anything from watches to flooring. As a designer what parts of Solid Surface appeal to you? How about colors, do they have an impact when designing? Where do you see solid surface heading with regards the design world? “I think the designers are beginning to realize the value solid surfaces bring to their works. At first it was seen as an expensive equivalent to plastics or granite. But slowly it gained its real value. It has a high-class look with regards to plastic, and it is much more easily manufactured with than granite or other stones... So I see solid surface as rising star shining in the design world of tomorrow." What about you? Are you ready for the next great surface? As a designer are you ready to bring your designs to the next level? As a consumer don’t just fall for a flat design, research the benefits of solid surface. Solid surface is renewable, has unlimited design potential, is nice to touch and easy to work with.